Makar Technologies carried out a Defence product build from PCB Manufacture and Cable Assembly, right through to Final Assembly and Test. This particular product is a motor drive, controlling the azimuth and elevation movement of a heavy cradle system for a Defence application. We carry out full life cycle support for this product. For our latest build, we reviewed the design and carried out obsolescence management; replacing components that were no longer manufactured with suitable alternatives. 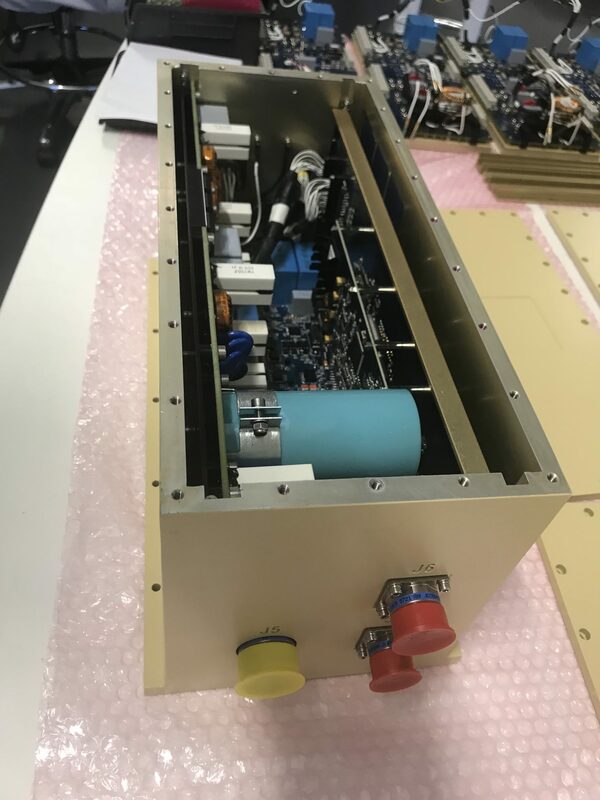 The Defence product build consists of the assembly of 4x heavily populated PCB’s, the manufacture of cable assemblies and then final assembly into the custom metal work. A Defence spec paint is applied to the metal work before final assembly takes place. IC’s are programmed in-house and then the units go through board level testing, followed by final ATP (Acceptance Test Procedure). The ATP is carried out on a custom test rig, designed and manufactured by Makar. This product is serviced by Makar throughout its lifetime. Servicing, Repairs and Test are carried out on any returns with full warranty supplied. These are our standard office hours, feel free to drop in and meet our team.